Today is the day I'm one of the hostess' for the Red, White, and Blue blog hop being head-up by Jane over at Jane's Fabrics and Quilts. So, here it is...it finish slightly under size...at 12.25, instead of 12.5 even though that is what I entered into the quilt program as the finished size. However, it is a free program and it was really helpful in getting templates for the triangle borders. I also learned that the squared off corners on the templates are a necessity for more nicely 'squared-up' triangle sections. then I took the three blocks, rotated them a little, added a small white border around the outside, and made a table runner/wall hanging... bound in a great red and white striped material. This is my results of my first design for my first blog hop! In this, I used a thin, plain white flannel (reminds me of homemade diaper material) that I got at the local Mennonite bulk food store. It made it a wonderful weight for this purpose... and would make a great batting for a summer quilt! On the back is red and white gingham, also from the bulk store! It's been fun trying to design something and see the progression of it into something! and acceptable, and perfect, will of God. This verse was discussed in Sunday School yesterday...the part about conformed, and that the meaning refers to being squeezed into a mold. We need to watch that we are not conformed - aka squeezed - into the mold that the world would have for us. 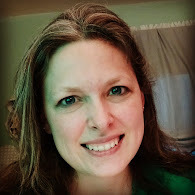 As a Christian, I need to make sure I am doing what God wants me to do, with all aspects of my life... including my blog. This encouraged me to keep including the Spiritual Reflections sections even if it seems that that section may turn some people off from my blog. The runner is beautiful--nice work! Great designs at here. Such a good article here. Your content as per you details are so good. I am appreciating your article at here. Thank you so much for sharing this knowledge of you. Keep sharing it in future also. Good luck for it. Well done in you first design. And you table runner is just stunning - really love striped bindings and this was a perfect finish for this. Thank you for sharing with us today. Its lovely - thanks for sharing. Thank you for sharing your skills in such a wonderful way. Hope you enjoyed your first hop. 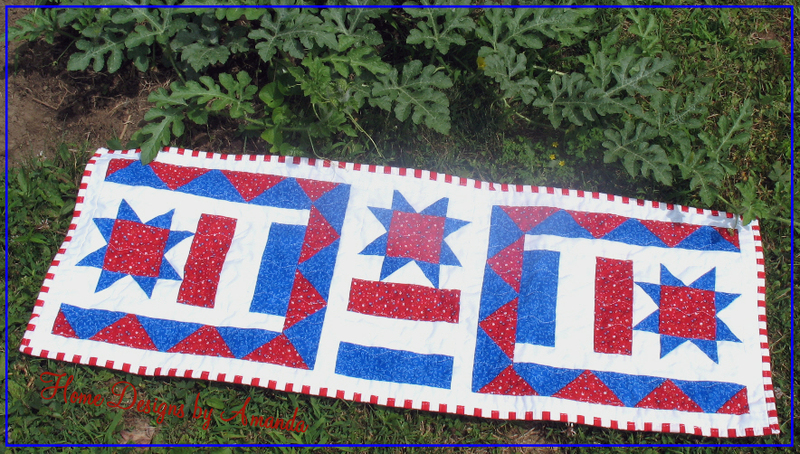 The block is great and made a wonderful table runner. I love your block and the table runner you fashioned from it! Great job!!! I also enjoyed your Reflections! Occasionally I share my faith in my blog also - it's my blog, about me, so I share whatever is in my heart at the time. Most of my followers know that faith is a part of my life. If not, they do not have to follow :*) I certainly value each follower, but I accept their right to choose waht makes them happy and ask that they give me the same right. Great design Amanda. I love the table topper. Thanks so much for sharing. A great fresh block...The entire runner went together so nicely. Looks great on your table. I totally agree with your reflection. Our scripture message in church yesterday was from Matthew 16-28. 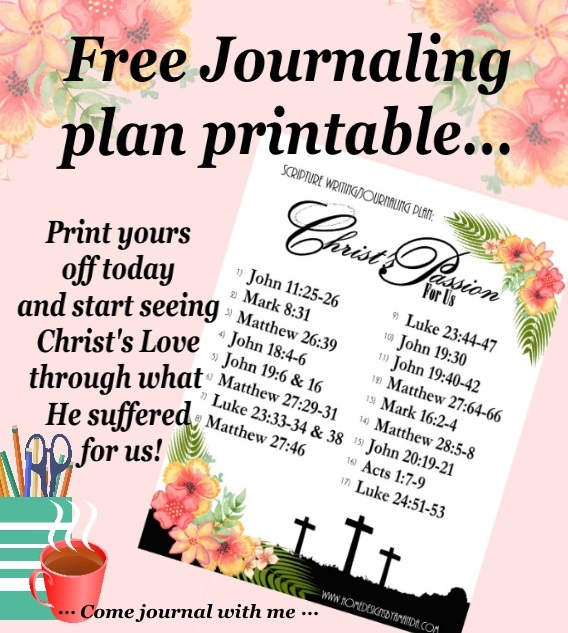 He focused on "If you are my Disciple." Using the words from verse 26: anyone, deny, take up, and follow. Nicely done. Congrats on a great table runner. Thanks for sharing, your tablerunner turned out beautifully :). So good to hop with you! Your table runner is adorable. Greater still is you Faith and your willingness to remain true to your self and proclaim the Goodness of the Lord. Be blessed my sister! May the Lord pour out His blessings upon you in over flowing lavish abundant rivers this day!! Love the table runner! Great design! I like the idea of using flannel, I think I will try that. I wish you had "follow by email" on your blog. I love block and a really lovely runner and I also like to use flannel for runners as it seems to work well and as you said is a nice weight. Thanks for sharing and being a part of the blog hop. Very pretty and I like the striped border you used too. Thank you for sharing your table runner. It turned out beautifully! Great job and the colors of your RWB tablerunner really POP!! I'm pleased you participated in your first blog hop so the rest of us could discover your lovely blog. Sharing your faith is welcomed by the majority of the quilting community or at least that is how I've found it to be! Hope this won't be your last blog hop! A table runner is such a great idea. You can use it all summer long since flag day is in June and August is, well, hot! This blog hop as give us a lot of inspiration, love your creativity and your table runner. Amanda, I love your block and table runner. Beautiful!! The stripe binding was just the perfect finish. Thanks for participating in the bloghop. Going to enjoy following your blog. Beautiful blocks and gorgeous runner!! Happy Hop Day, I just love your block, and the turned into table runner. I love to use a strip for a binding too. It looks wonderful. May I ask what quilt program you used. It would be fun to check it out! thanks so much for playing!! Suoper job! 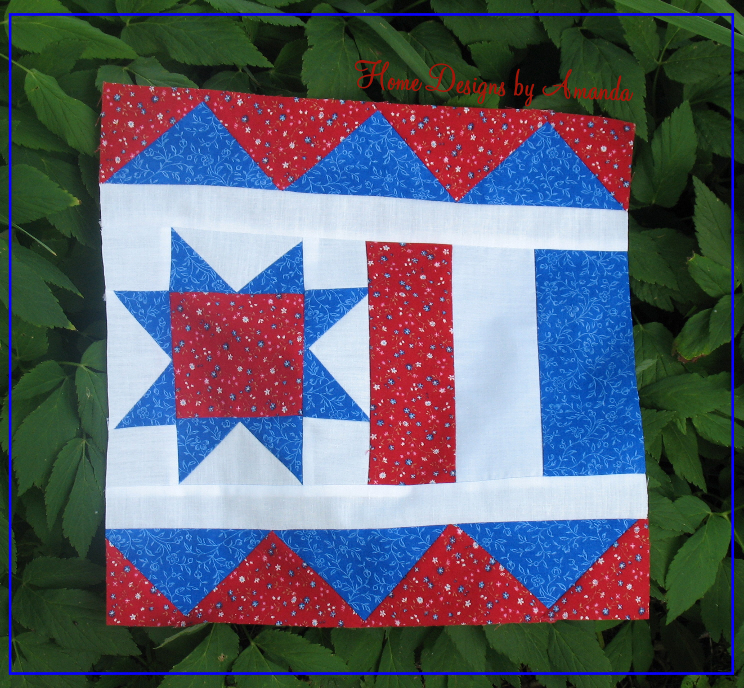 Love your block and the triangles along the sides. Thanks for your inspiration. Very pretty! Thanks for participating in the RWB hop! What a great looking block! I was wondering as I was reading what several blocks together would look like and then WoW, there it was. What a beautiful runner! The binding you chose is perfect. Thanks for sharing your runner and the link. What a pretty block. I love how it looks in the runner. Woo hoo! I like that block design. I'm going to have to check out that program, too. Thanks for sharing! I enjoyed your blocks, but more so the verses. Needed to hear those today....thanks! Love what you did with the block: Making a couple, and rotating it to make a super nice table runner! Thanks for sharing. Your table runner is really cute. I love the gingham back- such a tiny check. I am encouraged by your faith statement. I hope your other readers are as well. I love the block! Thanks for sharing. That's a great block....and I love the scriptures, too. Keep them coming. We can be "in the world" but must not be "of the world". Follow me too? Love the way the block looks in the runner. And I hope you continue using scripture. 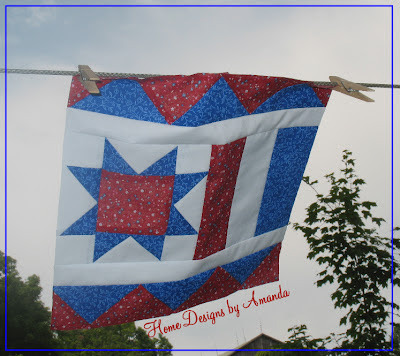 This is the first time I've vistited your blog and I love finding other Christian quilters out there. God Bless! Great block! It really works well as a table runner. I have never used flannel as a batting before, but it sounds like a good idea for a runner. Thanks for sharing your block and your faith. What a great block and a perfect table runner! Thanks for sharing! What a great looking table runner. I really love that you've used white flannel inside. I have a ton of white flannel sitting here. Great idea. Thank you for showing us. I love your table runner design!! Love the blocks and how you put them together. I am loving how so many of the participants are finishing off their blocks like this so we can see wht you do with them. I really love the table runner.....you have me thinking about making something with gingham! Your table runner is adorable! Great job. Thanks for sharing your beautiful block and table runner. I love that striped binding on the runner. Thanks also for the link to the quilt program. 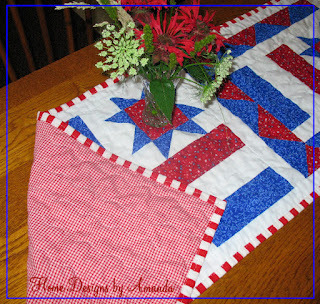 I Love your RWB Table Runner! 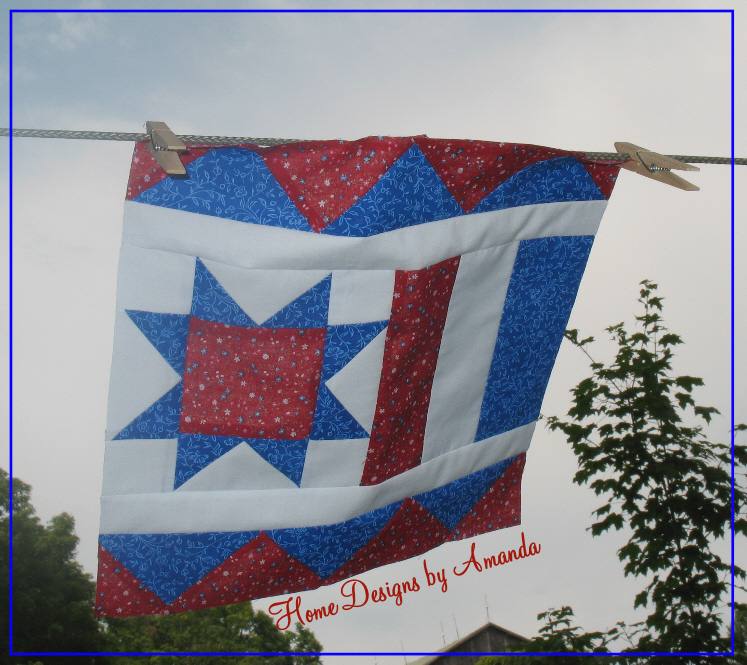 I Love Quilts because they are always One of a Kind! I love it! So cute and love seeing ones that would look great in any fabric! Your design does is that way...So glad to see you in the blog hop. You RWB runner looks wonderful...front and back! Hi Amanda! I am so happy I found your blog through the Hop. Wonderful block and table runner, and lovely scripture and reflection! That table runner is stunning!